Memory and story have a few things in common, well they probably have a lot of things in common but for the purpose of this review the main thing that they have in common is that neither of them have to occur chronologically. With stories the teller is free to recount events in whatever order they choose. The beginning middle and end of events don’t necessarily have to be the beginning middle and end of events as they actually happened. Memory of course works in a very similar way. Recount any particular past event and it’s very rare that the first thing that springs to mind is “the beginning”but more than likely somewhere in the middle before jumping back to the beginning via the end or vice versa. So with this in mind the first page of Headspace drops the reader into a scene that feels like it’s the middle of the story, but of course it’s the beginning for the reader, & for one of the characters in particular it’s also quite probably the end. While this may not seem strange at first some peculiar dialogue and a very odd tone cement the feeling that Headspace is most certainly an odd case… & that’s before we’ve even got to the bit with the Dragon & the cyborg dog that tends bar. For those of you reading this review however the main concern is not what order Headspace occurs in but whether it’s any good. In some respects it may still be a little early to tell as the first issue definitely raises more questions than it answers. That said it definitely does answer questions, and in doing so bucks the mystery box trend of prioritising intrigue over storytelling. Yes there is still intrigue by the shed load but Headspace balances it against the narrative rather than being led by it. While the book itself is mainly about the strange little town of Carpenter Cove, the focus of the first issue falls mainly on Shane. This, combined with some nice dialogue that neatly balances drama with greater meaning, leads the narrative down an interesting path and offers up a great final beat for the issue to play out on, though what stage of the actual narrative it occurs at is anyone’s guess. If anything I would have liked to have learnt a little more about Max and Carpenter Cove, but I can only assume that these threads will be revisited in time as the story goes on. The art of Headspace also does a fine balancing act. I’ve never been a big fan of having more than one artist on a book as the change between the two tends to pull me out of the story. The narrative conceit of having two different characters in two different places being involved in two very different stories means that two very different artists get to create two worlds that feel different enough from each other to reinforce the story but aren’t so far apart that they risk throwing the reader out when the two sides interact. Both Erik Zawadzski and Chris Peterson bring some great work to the table. While Zawadzski (I think it’s him, correct me if I’m wrong in the coments by all means) gets the lions share of the issue by drawing the scenes in Carpenter Cove as well as all the really crazy stuff, Peterson still leaves a unique mark in the scenes he gets to draw about Max. As good as the art (& writing) are however the star of Headspace for me is actually Marissa Louise whose colour palette on Chris Zawadski’s art breathes in life and reinforces important themes in the storytelling as well as playing off wonderfully against Chris Peterson’s own colours. Were this book published in Black and White I don’t think it would work anywhere near as well as it does. The deep night time hues of Carpenter Cove act as the perfect counterpoint to the pursuit of Max, with it’s bright daylight colours that allow the reader to know exactly where they are straight from the first panel. 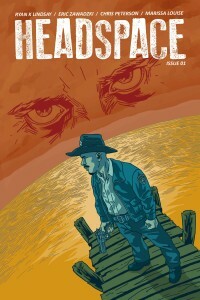 Given that Headspace is only 99 Cents on Comixology (or 69p to us Brits) it’s well worth a look, and the second issue is also out as well now. If TV shows like The Prisoner, or books like Morning Glories, scratch a particularly mysterious itch for you there’s every chance that Headspace #1 may be the beginning of something special for you.